Windsceen Chips and Cracks can occur anywhere, anytime and can make your vehicle unroadworthy which can incure a fine. Taking your vehicle to a repairer is never convenient but that doesn't mean you have to delay your windscreen repair. Inspecta Crack offers a Gold Coast Mobile Windscreen Chip Repair Service that allows you to get your windscreen repaired where you are and at your convenience. We are all time poor and can be tempted to put off "minor" repairs because they are too inconvenient. Delaying repairing a windscreen chip or windscreen crack can end up costing you a lot more money. Chips and cracks in your windscreen can expand quickly simply from the vibration or shock of hitting a small pothole in the road. If ignored a repairable chip or crack can suddenly require an expensive windscreen replacement. 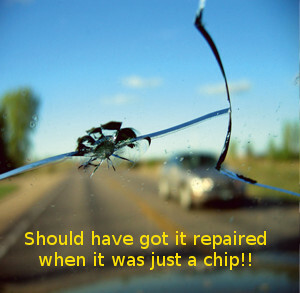 A chip or crack can also make your windscreen unroadworthy resulting in an expensive fine. Dirt and dust accumulating in a windscreen crack or chip can also make a repair more difficult and more expensive. You should never delay a windscreen repair and you no longer have to with our mobile windscreen chip repair service. Inspecta Crack's mobile windscreen chip repairs come to you. We can repair most Windscreen chips and cracks at your home, place of business or even in a public car park. You don't need to change your routine or take valuable time out from work to get your windsceen repaired. We come to you, where ever you are whether in Beenleigh, Coomera, Southport, Mudgeeraba, Surfers Paradise, Robina or Coolangatta. If you are on the Gold Coast and need a windscreen reapair, we can come to you.